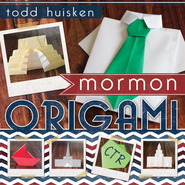 Keep your children's hands busy during church services with Bible Origami. Instead of folding the service programs into paper airplanes, they can fold Noah's ark, an oil lamp, or Joseph's coat! As you develop the unique skill of creating these simple-to-intermediate origami designs, you will find opportunities to use them with all ages for lessons, activities, crafting, and everyday fun! What a fantastic idea to keep younger children occupied during church but to do something with a message. This book shares many stories from the bible and each page has a "Did You Know" at the top of each page with a fact that you may or may not have known about the bible. I'm only a semi crafty person, but my stepson has done Origami before so I asked him for his assistance in trying some of these pieces. I could handle most of the level 1 and level 2 took some time. He was able to do various level 3 pieces with ease. The drawings are explicit and show you step by step how to recreate the different pieces. Great book to keep little hands busy in church meetings! I love seeing all of the great things that are out there to keep your kids occupied during church meetings and this one is just great! What better idea is there than to keep your hands busy and your mouth quiet (hopefully) while sitting in Sacrament meeting. And, they usually give you a program that you can use for paper, bonus! I loved the cute ideas in this book. Each of the ideas goes with a scripture story. The illustrations were cute and I completely loved that there were fun facts about each of the stories to go along with the origami idea. I also loved that there are different skill levels represented, there are even a couple of different origami models in different skill levels - genius! I have included just a couple of pictures that I thought were perfect for this Christmas season, Baby Jesus in his manger. This is a cute, fun book that kids of all ages will enjoy! Bible Origami is Challenging and Uplifting Fun! My main critique is that I wish there was more full color pictures of the finished products rather than just drawn. And at times the directions are a bit vague, yet I was able to follow after some study. I received this book for free. All opinions and information are my own. AND I really did enjoy this one and suggest it!